The halls of the White House are decked for the holidays, and now so too is that giant Colorado blue spruce in the back yard. With the help of his teleprompter, President Obama and the first family tonight counted down to the lighting of the National Christmas Tree on the Ellipse. The Obamas light the 2014 National Christmas Tree during the National Christmas Tree lighting ceremony at the Ellipse near the White House in Washington, Dec. 4, 2014. The annual production by the National Park Service and National Park Foundation, which dates back to 1923, is famously scripted for a family-friendly audience with a hefty dose of cheesy humor. "Did you know Calvin Coolidge played the harmonica and had two pet racoons?" quipped co-host actor Tom Hanks in the opening monologue. "How did you know that?" asked co-host actress Rita Wilson, feigning disbelief. "His Facebook page!" replied Hanks. The line drew some audible groans amid the polite chuckles in the crowd. For the first time in the 92-year tradition, the 2014 National Christmas Tree had a presence on social media, posting a humorous play-by-play from its Twitter account, @TheNationalTree. The celebration featured a star-studded concert with musical performances by Patti Labelle, NE-YO, Steve Miller, The Tenors and Chely Wright. From the front row, the president and his mother-in-law Marian Robinson were seen swaying and clapping to the tunes. 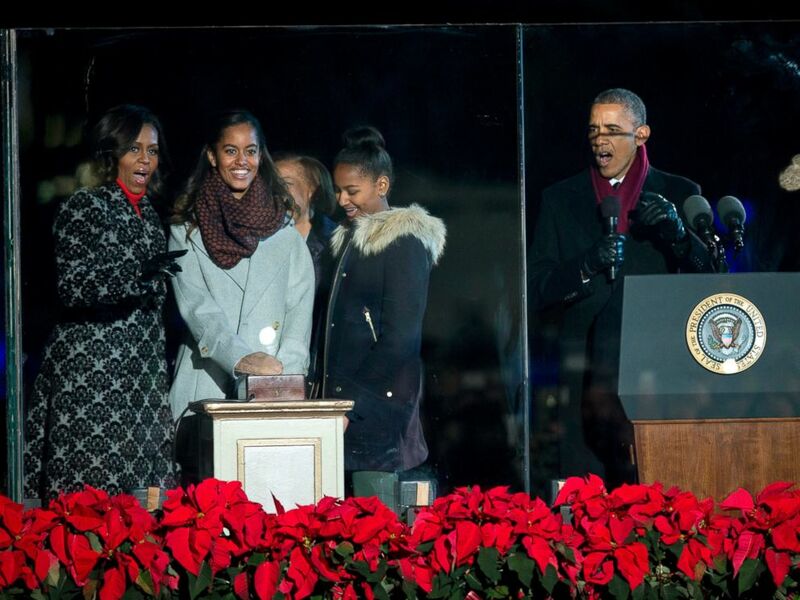 Even the first daughters, Sasha and Malia Obama, were spotted singing along. Mrs. Obama and star Little League pitcher Mo'ne Davis read "The Night Before Christmas" to a group of young school children. Not to be outdone, President Obama took the stage at the end of the concert to groove with Santa.